Isn’t it time for an efficient and welcoming work area? Kick home office clutter to the curb! 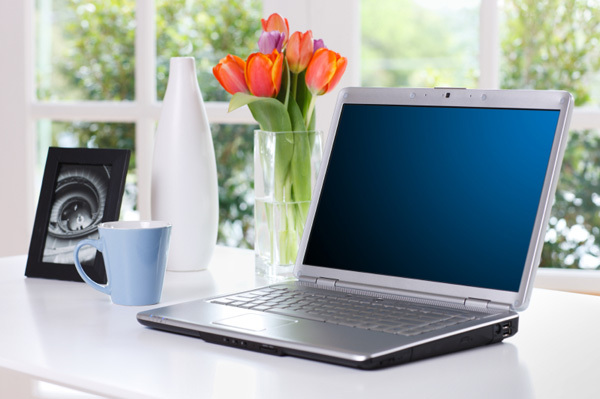 It’s spring and the ideal time to clean and freshen your home office. Take a day to organize your work space and kick home office clutter to the curb! An organized space will help you accomplish more without the hassle of searching through stacks of paper and digging around for office supplies. Your space will be more conducive to work and you’ll find your concentration improves. Help yourself out by making the home office an efficient work area — spring-clean it! Nobody wants to look at a desk piled high with to-dos and unfinished work, not to mention things that don’t even belong in the room! Get some storage and organizational help and put everything in its place. Begin by clearing the desk and cleaning it thoroughly. Have good lighting? It’s the first thing to add so that you can work comfortably. Check out your desk chair, too. Long hours at a desk with an uncomfortable chair can be physically exhausting. Replace the critical items that are making your work harder than it needs to be. File completed work and organize the desktop with items you’ll use all the time: your computer monitor or laptop, stapler, notepad, pens and so forth. A tiered paper rack keeps completed, in-progress and to-do project papers separated and handy. Filing a problem? A gently-used file cabinet can often be found at thrift stores, or opt for portable convenience with plastic file boxes with lids. They hold dozens of hanging files, are stackable, come in many colours (so you can colour-code by client or project) and are often less than $15 at office supply stores. Once you get the flood of papers properly filed, you’ve tackled the biggest obstacle to a clutter-free home office. There’s nothing more irritating than having to stop mid-work when your printer cartridge gives out or the copier paper is down to one tattered sheet! Have a supply list for your office and note when you need to restock. An armoire, chest, trunk or even a closet can house office supplies out of sight, so you’ll never be caught short. Invest in what you anticipate needing for the next few months and store it away. Time and money spent now will be worth the convenience later. Clean out the desk drawers and wipe them down with a damp cloth. Before reloading them, group items and decide where they go, so you can find paper clips or the address book with ease. Dump all the pens without ink and toss obscure scraps of paper with scribbling you can’t decipher. From now on, you are a lean, clean organized office machine — with a smarter system! Pin up a simple corkboard or whiteboard for notes, appointment reminders and deadlines, and have a calendar nearby, too… one with large print for days and dates that you can read without squinting! Don’t forget to wash the windows, vacuum the floors and give the room a good overall cleaning. Add in a little “pretty,” too… a favourite photo in a sleek frame or a potted plant for colour and life. You spend considerable time in your home office space, so make it clean and efficient without sacrificing visual pleasure.